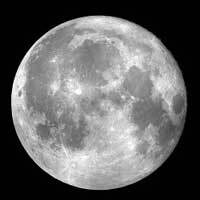 A full moon tonight, and it will be high in a clear sky. When I look up at the moon, I see it differently than I did only a few years ago. It's amazing how your perception about something can change when you learn more about it. I had never thought of the fact that our moon is the only moon in our solar system that is of comparable size to its planet. This creates a massive gravitational influence on our oceans, which we call tides. This pull has caused water to rush inland for billions of years, a dynamic that may have created the conditions for early life to form. This pull also keeps Earth from wobbling wildly on its axis, as some other planets do. Such a wobble would create chaotic climate and intolerable weather conditions, such as frequent ice ages. Not good for intelligent life. Thank you for being there, moon. Our moon was formed over 4 billion years ago when a planet crashed into Earth, spewing debris into space, which then aggregated into our moon. The impact was the most significant event in the history of our planet. It increased the size of our molten iron core, which is the reason Earth has a substantial magnetic field. This field protects us from the daily bombardment of deadly solar radiation, which would kill all life on the planet. Such a core isn't "standard issue" for planets. Our moon has no such protection, and neither does Mars. Also many of the asteroids that might come crashing into the Earth are captured by our moon's gravity. That's why our moon has such an interesting "face." Good luck for us! These facts have made me more appreciative and fond of the moon...and the chance events that created it. I used to take this gorgeous presence for granted. It can happen when something is there all the time. Post by Dennis E. Coates, Ph.D., Copyright 2010. Building Personal Strength .